Described as “one of the most vulgar forms of barbarism,” by Rep. John Kasson (R-IA) in 1882, a series of laws known as The Chinese Exclusion Act passed by the United States Congress between 1879 and 1943 resulted in prohibiting the Chinese as a people from becoming U.S. citizens. 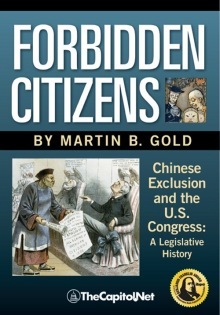 Forbidden Citizens recounts this long and shameful legislative history, telling the inside story of the battle over Chinese exclusion, examining all of the exclusion laws using the words actually spoken in Senate and House debates. [L]andmark volume on the subject of exclusionary policies against Chinese and Chinese Americans … a valuable teaching tool … an exemplary subject reference. Highly recommended. Lower-division undergraduates through faculty. For complete Table of Contents, sample sections, and secure online ordering, see ForbiddenCitizens.com.